Film review by Jason Day of War for the Planet of the Apes, the next addition in the rebooted Planet of the Apes franchise, starring Andy Serkis and Woody Harrelson. Decades after a virus that passed from Apes to humans wiped out most of mankind, the surviving Apes have established a successful community led by Caesar (Andy Serkis). But a war-mongering Colonel (Woody Harrelson) is psychotically determined to kill all apes and threatens their harmony. Then, the long-dormant virus reappears, making humans mute. As time goes by we inch closer to the time periods of the dystopian TV drama and film of late but hopefully not the horror and perversity they depict. The topsy-turvy world in Pierre Boulle’s source novel Le Planet des Signe (1963) and its original film and TV off-shoots posited that the natural progression of Darwinian theory was a farce and humans would outlive their civilisation and devolve back to grunting, clueless mammals. Depending on where one lives in the UK, we might already be here. Those Planet productions were smart and witty, but eventually came unstuck with plot points science fiction was unable to properly explain. How did apes master speech in only 500 years, when their voice boxes are so different to humans? The more recent film incarnations are set in a parallel present and take persuasive advantage of our modern understanding of disease and genetics. They do this while remaining wonderfully succinct, helping fill in the the logic gaps that befell the Roddy McDowell/Kim Hunter series. In this third addition to the reboots, disease study informs the writing: a mutation of the simian plague that more or less kills humanity re-emerges after laying dormant in the survivors, rendering them mute. In the original films, mankind is dumb and cannot speak, but no full explanation given about how this happened. 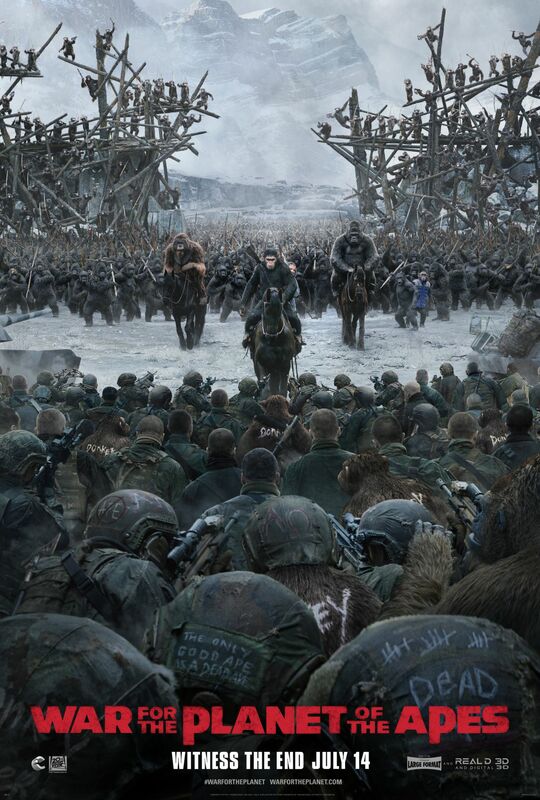 Winter’s coming…for apes and humans in War for the Planet of the Apes. Image: 20th Century Fox. There are appreciative nods to the original films. Wise orang-u-tan Maurice is named in clear reference to British actor Maurice Evans, who played Dr Zaius. Mute girl Nova has the same name as Charlton Heston’s love interest (played by Linda Harrison) in the 1968 movie. We open with a bit of Full Metal Jacket style (1987) military nihilsm: during a vicious, explosive, cross-species battle, the humans’ helmets carry slogans with murderous simian references (Monkey Killer and Bedtime For Bonzo, the title of a mildly amusing Ronald Regan comedy from 1951). It’s patently obvious who the ‘savages’ are in this film. Despite human protestations they are more evolved, it is the chimps, gorillas and orang-u-tan who fight according to a chivalric code. Humans, led by Harrelson are so desperate to hold on to their phylogenetic one-upmanship, they can’t see the paradox to their slaughtering of chimpanzee females and children. This is further underlined by the solemnity and gentleness of the ape’s water funeral, contrasted with the diseased humans, who are shot in the head and left out in the snow. Cesar is even prepared to try and understand the actions of man after launching an all-out personal vendetta following Harrelson’s slaughtering of his family. There are more complex emotions and empathy from the apes than their increasingly regressive human peers, helped in no small part by the playing of actors such as Serkis, who are skilled at being convincing when unrecognisably ‘CGI’d’. The reawakened virus seems like a merciful act of God, stripping human voices and rendering us gibbering, imbecilic, harmless animals. Ship-shape in terms of the writing and solid performances, Harrelson in particular does well to keep his temper in check during moments that for another actor might have resulted in foaming at the mouth frenzy. But the quality of this film is just a tad lower than the previous entries as the emphasis (understandably, given the title) is on battle rather than drama. There’s even a good ole Trumpian reference worked in. As the apes, seen by man as the ultimate unwanted settler, toil to build a great wall Caesar declares “This wall is madness!” Quite; but when will humans collectively wake up and realise that? See the trailer on the official site. Director: Matt Reeves. 140mins. Chernin Entertainment/TSG Entertainment (12a). 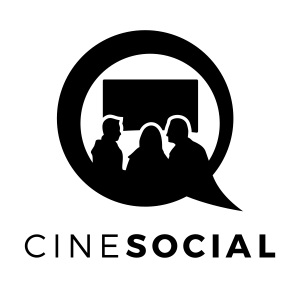 Producers: Peter Chernin, Dylan Clark, Rick Jaffa, Amanda Silver. Andy Serkis, Woody Harrelson, Steve Zahn, Amiah Miller, Karin Konoval, Terry Notary.